A few weeks ago, whilst browsing ye olde internette, Cuttthroat Island playing in one window, an eBay search listing all “Crystal Pepsi” references open in another, I stumbled upon a review of Pirate’s Brand potato chips. I wish I could remember the site, but sadly I cannot. The review was very positive and couldn’t wait to look for them on my next snackspotting adventure. But alas, ‘twas not to be. Skip ahead some days, and I find myself sojourning in the City of Brotherly Love, strolling through a Shop Rite grocery store. And lo, what do I see twinkling at mine eyes from one of the potato chip shelves? The shiny metallic foil of a bag of Pirate’s Booty! And sour cream and onion at that! Perhaps my favorite of all flavors. So I got all excited, like JoJo the Idiot Circus Boy, with a pretty new pet. I ran to the apathetic cashier and paid for my pretty new pet. But then I waited. To build the suspense. I packed them in my suitcase and brought them home to Florida. The first night back, I took out my pretty new pet, ready for some sour cream and onion transcendence. But there was treachery afoot. In my Pirate-Booty-finding excitement, I didn’t bother to actually read the bag. I only trusted in the diligent shelvers to stock chips with chips alike. So with mouth agape, I read the five words that no one wants to read when they are expecting to enjoy delicious potato chips: “Baked Corn and Rice Puffs.” I threw up all over myself in grief. I didn’t even know what to do with these things. I shoveled a handful, begrudgingly, into my mouth. 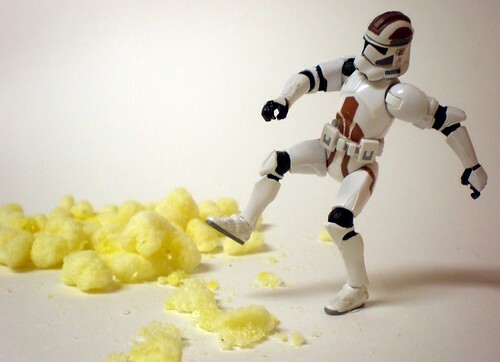 These have all the texture of Styrofoam packing peanuts. And the taste is not too far off either (and yes I know what they taste like because like everyone else did, I’m sure, I ate Styrofoam packing peanuts as part of a college performance art piece protesting the cancellation of Felicity). For a femto-second they taste like they could be related to a cheese puff. My brain fired its Cheeto neurons at the near recognition of a food product. But they’re more akin to the cheese puff’s hemophiliac, asthmatic cousin. The corn and rice-ness almost has no flavor whatsoever. 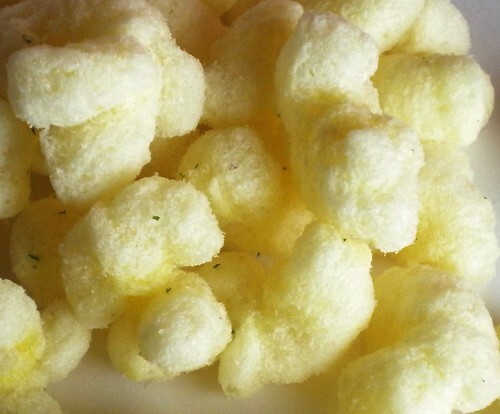 The puff itself seems to be only a placeholder for the “Sour Cream and Onion” powder. I put that in quotes for the following reason. This is how I imagine these were made. Someone made a bag of puffs and was walking with the bag down the street. Someone else just left a convenience mart munching on a bag of sour cream and onion potato chips. These two people passed each other on the street, and their elbows brushed against each other casually. That’s it. Because the amount of flavoring on these things could be measured in the units they use to measure Charlie Sheen’s comedic abilities. We’re talking a flavor asymptote approaching zero (College Algebra grade: C minus). I would barely call these a food product. Pirate’s Booty, these certainly cannot be the treasure of which you speak. Perhaps you are missing part of the map. I think you need to check in Mikey Walsh’s attic again. I may be alone in saying this, but I enjoyed Crystal Pepsi. Really, I did. It wasn’t the awesomness that is Pepsi, but I thought it tasted just fine. I’ve certainly had worse things. Like Jolt. And Red Bull. 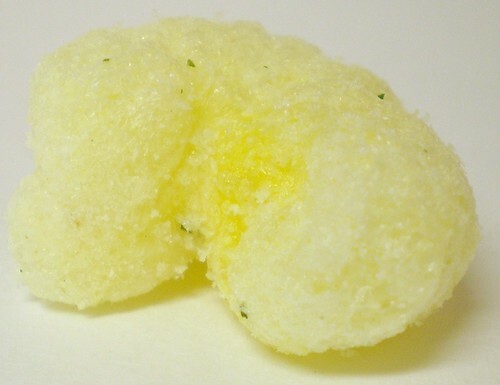 But anyway, the consistency of those rice puff things reminds me of the Quaker Oats flavored mini rice cake snacks…I forget what they’re called. I thought they were great (I like rice cakes in general, and I’m probably alone in saying that as well) but they’re pretty expensive per serving so I stopped buying them. One of these days, I will buy some Crystal Pepsi on eBay and review it. Hopefully it wont kill me! I think I know the rice cakes you’re talking about. My mither used to have them around when I was younger. LMAO:] Another brilliant and funny review!!! 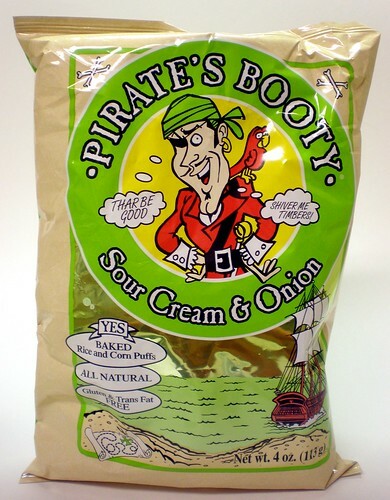 Before I became vegan I use to eat pirates booty for every meal, I was in love with the stuff. I am talking about the white cheddar pirates booty, that is the only good one in my opinion that they make. Before you knock them off entirely I would suggest you try the white cheddar, its delicious. I agree with you though on the sour creamand onion ones, they taste like nothing and I was disappointed as well when I tried them. Thank you thank you. Alright, I will try to find some white cheddar. If the sour cream and onion ones actually had any flavor, they might have been good! Awesome blog- I LOVE the storm trooper tie in throughout! Sorry the chips were not chips but looks like you had fun photographing them anyways!